The outsourcing industry is going through a churn. For the longest time the industry’s proposition to customers was simple: we will do a bunch of non-core tasks at lower cost. 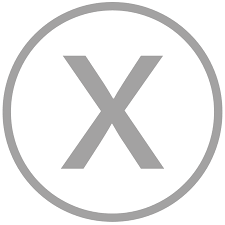 Service providers worked on a “lift and shift” model where in-house processes were moved outside, and repeated without any perceptible change in value. Clients also had low expectations in terms of technology innovation and the gravy train continued chugging along. But of late the scenario has drastically changed with the rise of cloud and mobile technologies that are replacing costly and legacy IT applications with pay as you go XaaS products. An enterprise no longer has to pay millions of dollars in contracts to build and maintain a CRM suite: they can sign up for Salesforce. Right now there is a significant disquiet among business leaders when it comes to outsourcing service providers. 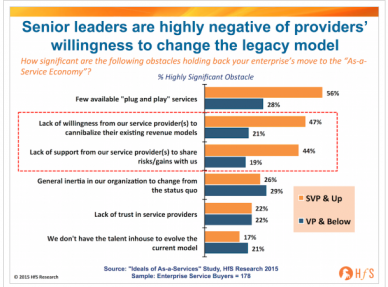 According to a survey by Horses for Sources a significant percentage are not happy with how their existing service providers are not helping them adapt to changing circumstances where the XaaS model often reigns supreme. 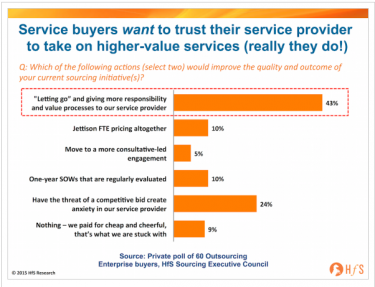 As a result, as the following data shows, there is a growing trust deficit between the enterprise buyer and the service provider. 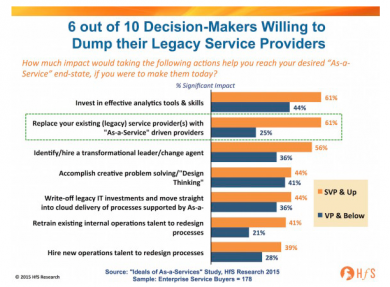 This legacy model is not cloud friendly, and enterprises and established players are feeling the heat from nimble startups that canleverage the cloud and offer competing products at the same value and a fraction of the price. So the clamor among buyers is for service providers to junk static mindsets and join the innovation bandwagon. But if they don’t then buyers are more than willing to pull the plug on existing relationships. This can cause problems for the buyers, but plenty of clients are waking up to the fact that service providers need to be less commoditized vendors and more business partners if they have to survive. So if you are an enterprise looking to outsource in this fast moving and rapidly changing business environment what should you look for? 1) Is the vendor innovation oriented? What does the vendor propose? Do they keep themselves limited to saving time and money by moving operations to low cost countries? Or are they willing to embrace risks, and invest in new technologies (big data analytics , robotics process automation, and IoT)and talent? Most vendors are still focused on their margins and their quarterly numbers. You don’t want to do business with them. 2) Are they as-a-Service friendly? On the face of it as-a-Service model cuts into margins of vendors as automation means fewer warm bodies and less billable resources under the traditional services model. But building as-a-Service architecture is the future with client needs becoming more complex. If your service provider can’t offer you such platforms at scale then you will likely waste your resources, and will have to retool all over again in the near future. 3) Is their internal structure compatible to your needs? Most legacy service providers are organized vertically, with different service lines like infrastructure, application, outsourcing and product organized in discrete silos. But what if you need an integrated service? If your service provider is used to working in narrow verticals and can’t offer you horizontal integrations you will be out of luck and be stuck dealing with red tape and inefficiencies. You might be willing to take risks to ensure that your business model survives in a new economy where old rules and models are no longer valid. But is your outsourcing provider shaping up to the new realities, and partnering with you to shoulder the new risks and offer solutions? If not, they are going to be an impediment to your success.